The anniversary of the National Apology to the Stolen Generation still brings deep, heartfelt tears to Brisbane Indigenous elder Theresa Nunn. Source: The Catholic Leader. Yesterday marked 11 years since former prime minister Kevin Rudd apologised on behalf of the nation to Australia’s Indigenous people. “I am from the Stolen Generation, I was taken when I was seven years old with my older sister and three brothers,” Ms Nunn said, proud of her Nunukul tribal connection with North Stradbroke Island. As an Indigenous support officer at St James College in Spring Hill, Ms Nunn ensures that Aboriginal and Torres Strait Islander students are versed in their culture that has been lost over generations. Ms Nunn said she witnessed “the impact of the Stolen Generation still happening today”, referring to the impacts of grief, pain and intergenerational trauma. Still, she said sad stories, like her own, needed to be told. “As a family we are still dealing with the trauma that has been put on to us. This day is very special because it helps us heal,” Ms Nunn said. “My father was in the Korean war, overseas fighting, and he once said ‘our enemies are in our own back yard’. “I finally realised that my older sister still hears me screaming … about being taken,” she said. Ms Nunn said her story fuelled her passion for young Indigenous to keep traditional stories, dancing and culture alive. 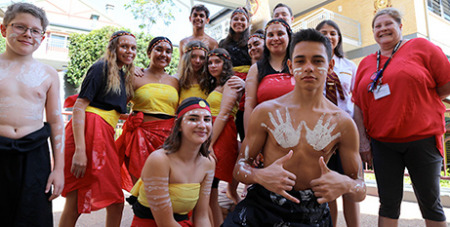 St James College has 25 Indigenous students, and most participated in a school dance performance during a ceremony marking Apology Day yesterday.